These vanilla cupcakes will blow your mind! I know this is a strong statement but they are so moist and bursting with vanilla flavor, you just won’t believe it! They’re nothing like those dry ultra fluffy bakery cupcakes they make you sad and full of regret, these are worth it! I’ve made this recipe for years and was SHOCKED when I realized it wasn’t on the blog, so I’m fixing that now and sharing this Super-easy and really delicious recipe with you. I made them for a friend’s birthday recently and the next day she texted me “How are they so most on day two?! ?” -That’s how good they are. A bit of advice on the ingredients. You can get the cheapest flour, sour cream, milk and even butter but you have to get good vanilla for this recipe! It’s the main flavor and you want it to shine so go find a good real vanilla extract and it you want to get points for being fancy use some vanilla bean paste too while you’re at it. People love seeing the little specks of vanilla in the cupcakes. Feel free to modify this recipe! I especially love these cupcakes with a dollop of Italian meringue buttercream on top as it’s less sweet and lighter (Tasting not calories) than American buttercream. You can definitely add sprinkles to this, 1/3 of a cup should do, to make this an amazing funfetti cupcake! Baking papers come in different sizes and everyone’s oven is slightly different. I like to turn my pan halfway through baking and toward the end of the baking time I keep a close eye on the oven. Once the centers are springy and a toothpick comes out clean the cupcakes are ready. Being watchful at the end lessens the chances of having caramelized dark edges on your cupcake, ensuring it’s light, soft, and moist! 1. Preheat oven to 350 degrees F. Place cupcake papers in a cupcake pan. In a large bowl, sift the dry ingredients together until incorporated. Including the sugar. 2. In a large bowl, mix the wet ingredients. 3. Add the wet ingredients to the dry ingredients. Mix until combined. 4. 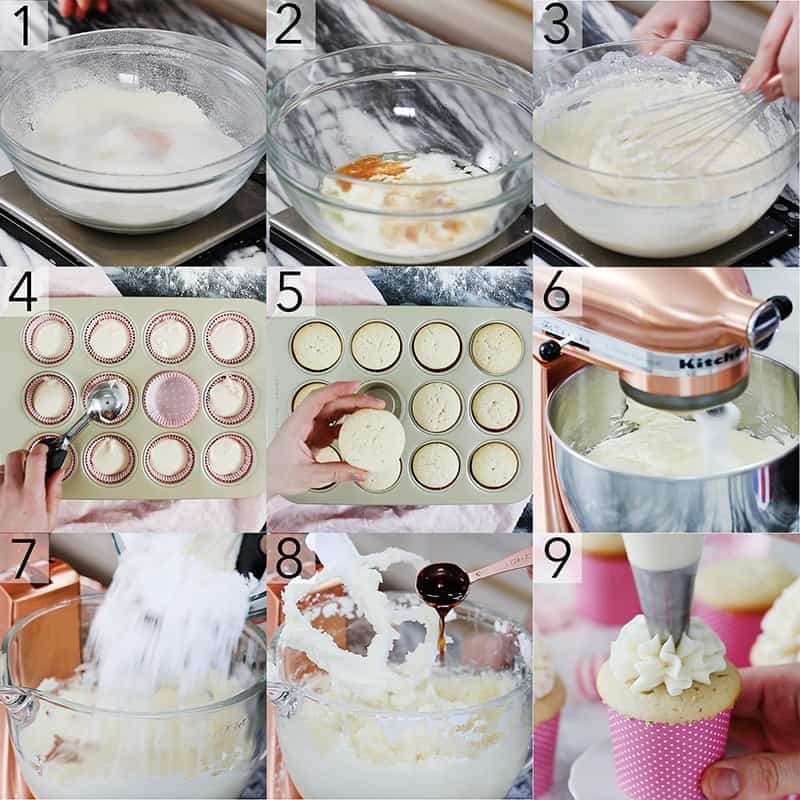 Distribute the batter evenly into cupcake papers. 5. Bake for 15-20 minutes or until golden and springy to the touch. 6. In a stand mixer fitted with a paddle attachment, cream the room temperature butter. 7. Add in the confectioners sugar in two batches. 8. Add salt, milk and vanilla. Mix until fluffy. 9. Transfer the buttercream to a piping bag. Pipe a large dollop of buttercream on each cupcake. A simple vanilla cupcake for any occasion! So moist, fluffy, and delicious you'll make them every week! Preheat oven to 350 degrees F. Place cupcake papers in a cupcake pan. In a large bowl, sift the dry ingredients together until incorporated. Including the sugar. Add the wet ingredients to the dry ingredients. Mix until combined. Bake for 15-20 minutes or until golden and springy to the touch. In a stand mixer fitted with a paddle attachment, cream the room temperature butter. Add in the confectioners sugar in two batches. Add salt, milk, cream and vanilla. Mix until fluffy. Pipe a large dollop of buttercream on each cupcake. When mixing the wet ingredients don't worry if you see little lumps of butter. When added to the dry mixture things will become more homogeneous and everything will be golden after the bake. 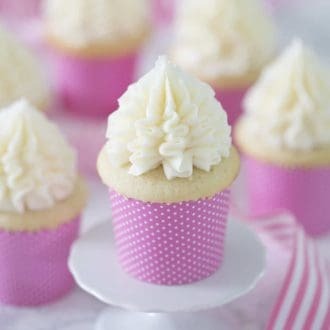 Try to use a good vanilla to flavor these cupcakes, it's really the main thing you taste. 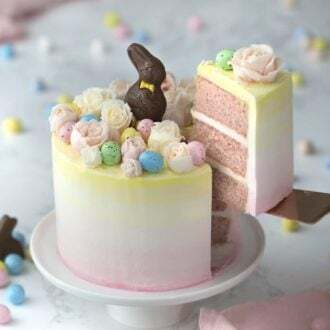 Vanilla bean paste is a favorite of mine; it tastes great and you get to see all the little beans throughout your cupcake. Can I use pasteurized egg whites in a carton? I have been searching for years for the perfect vanilla cupcake recipe that’s easy to make and requires simple full flavored ingredients. 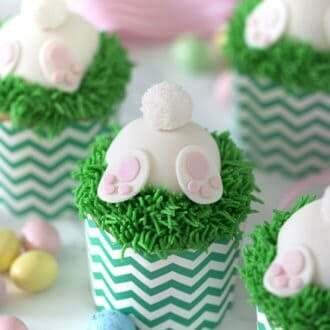 These cupcakes are what I’ve been searching forever for!! 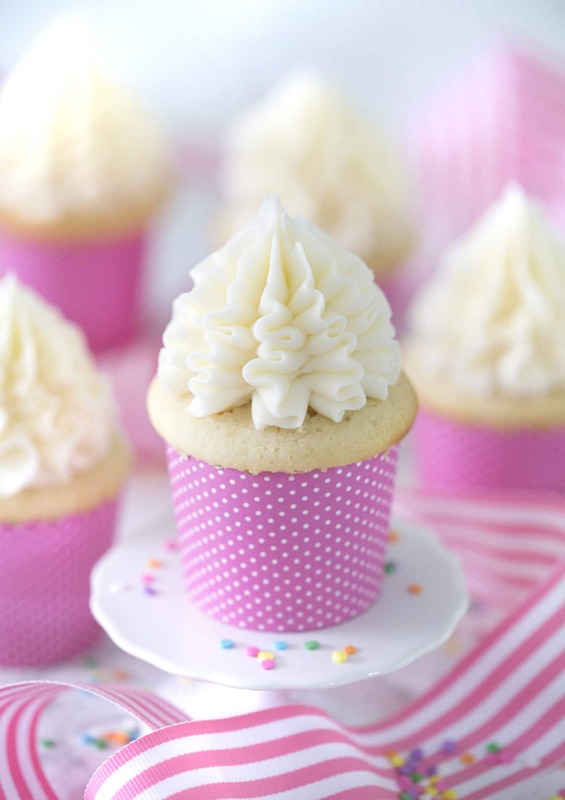 They are everything you want in a cupcake – fluffy, moist, delicious taste of butter and sugar. They are also very kid friendly to make, my 5 year old loved mixing everything. I’m so happy you like them Denise! They’re what my friends ask me to bring to parties! Thanks so much Soni! I’m very happy you liked them! These were the best, most delicious, most moist vanilla cupcakes I’ve ever made. I think I’ve found my new go to recipe for vanilla cupcakes! This makes me so happy! I am crazy about these cupcakes too! These ended my search for a delicious non-chocolate cupcake! Truly good in every way. Also, please know that you inspired me to order pastry bags and tips and try making frosting roses, something I had always wanted to do. Your video of how to make buttercream flowers made it look so easy…and it was! Amazing results the very first time. So now I can’t wait to make cupcakes again and top them all with way too many frosting roses. I love your videos!! You make me laugh, and I enjoy your food sensibilities and enthusiasm. This message brought me a lot of joy! I’m glad you enjoyed the recipe but i’m also so glad you took the step in buying piping bags and tips! Have so much fun baking. Thanks for the nice words, JK! Your videos bring me a lot of joy, so we’re even. Glad to see another “North Campus” person finding success in a creative field. Loving your cocktail series, and looking forward to whatever you do next! If using vanilla bean paste do you use the same amount as the vanilla extract? Thank you for the positive feedback! I’m glad you enjoyed the cupcakes. 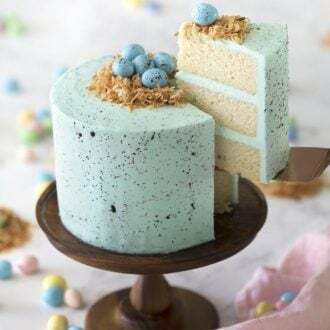 I made these with your vanilla Italian buttercream and OMG, I’m in LOVE! Thank you for sharing the recipe. I’m glad you enjoyed the cupcakes. Have you tried any of the recipes? Woooow hice la receta y la amé, definitivamente mi favorita. I baked these just today, and they turned out lovely! Thank you so much for sharing such a wonderful recipe. 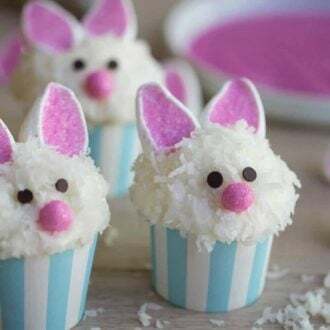 These cupcakes are oh-so-easy to make, and I was able to whip them up while our 6 month old was napping. Now that’s what a call a quick recipe! Looking forward to trying out all of your other recipes as well. This is the very first time I have tried to make cupcakes and they turned out great! I am so happy that I found you on YouTube, I love your instructions, notes and comments. 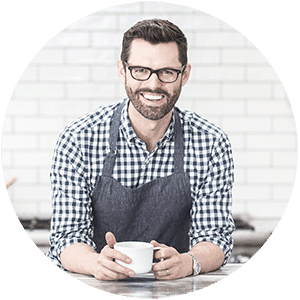 I am looking forward to try more of your recipes. Thank you very much! Hi. I made these cupcakes. Thank you so much for sharing. Thank you for the tips. Oh my gosh…i made buttercream icing!!! All I can say is wow this recipe is truly the best, I am a novice baker.I made these and everyone loved them,I will make again using Italian buttercream,thank you John I’m in love with you and all your recipes. So sweet, thank you Mayra! Made this morning for the first time. My favorite cupcake ever is the vanilla cupcake from Sprinkles. This is so similar I almost did a dance! This is now part of my permanent rotation now. What brand of vanilla do you recommend? Made these for my God child’s wedding. Wonderful. This is the BEST vanilla cupcake recipe. At first, I thought it was odd not to cream the butter and sugar, but the result is heavenly. I’m going to try them with the Italian buttercream next. Thanks so much for sharing!! I like your recipes. Your tips and tricks are sharpening my baking skills. Thanks for sharing!